I got a surprise late Christmas package all the way from Sweden! It’s from my pals Jake, Angel, Freddy, Izaak and Rory. And their human! 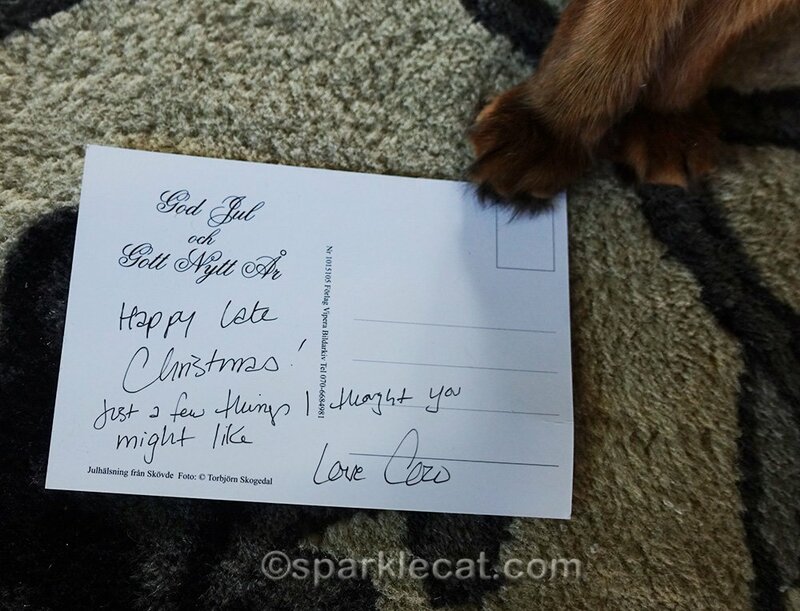 Their human even included a card. The presents were enclosed in this really cool tote bag! 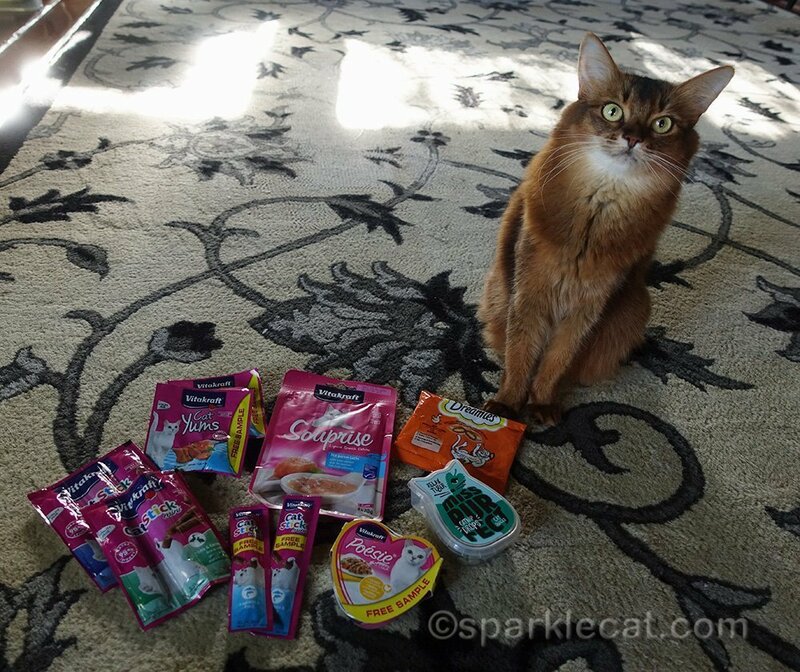 Look at all these awesome cat treats! 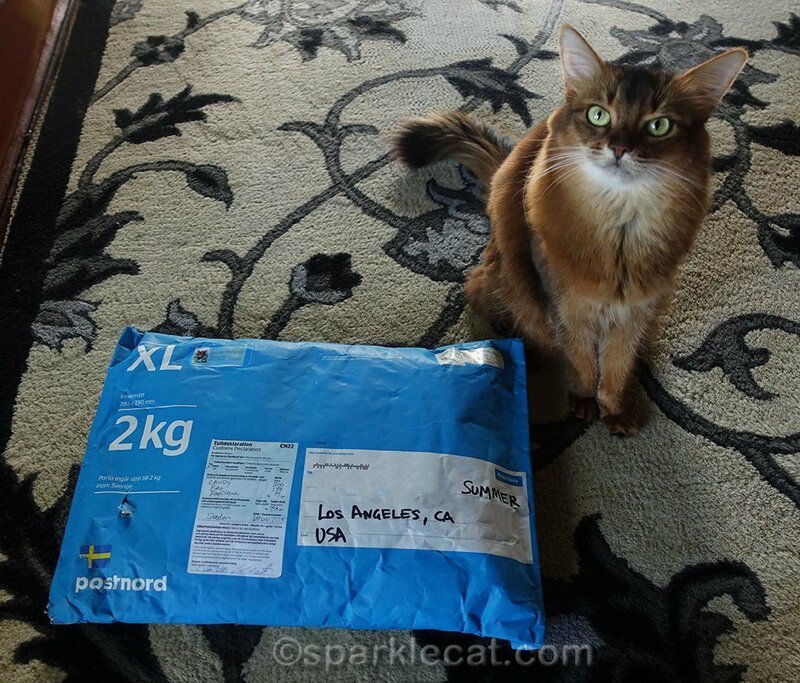 They know I love the Vitakraft sticks that are only available in Europe, so they sent me a bunch, plus a lot of other treats you can’t get in the U.S. Don’t worry, I will share with Binga and Boodie. They remembered my human too! There was a clip on light (since it’s so dark in Sweden during the winter, I gather they must use these a lot! ), a key chain with art from Lisa Larson (who also did the art on the tote bag). 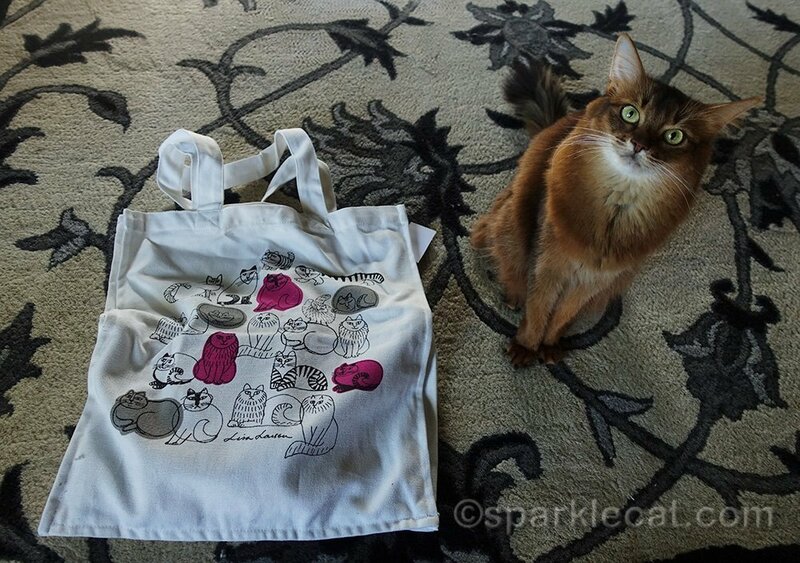 And my human’s favorite item, which was actually from Japan, not Sweden…. A tiny cat skeleton with moving parts! It also came with some accessories, including a litter box. Having a sense of humor that seems to have frozen at age 12, this was the first thing my human did with her new toy. Thank you so much for these, guys! We are (clearly) really enjoying them. Furry kewl par-cell you ree-ceeved Summer! An trust mee LadyMew wuud have dun THE same thing with Cat skellyton an litterbox! We totally get why you love the kitty skeleton too! Some peeps have no sense of humor or whimsy. That kitty skeleton is so cool and so relevant to the rock scene that maybe they are too old or too young to get the meaning of it? We love that though as my mommy is a former rock follower from the 80â€™s and gets it. We still know some cover bands for AC/DC, Motley Crue and other 80â€™s bands. My daughter in laws dad is in a band in Portland, OR but she doesnâ€™t remember what the name of his band is. Go figure! His name is Tommy Von Schilleriff. I donâ€™t know if you know him but I know you are familiar with the Portland rock scene. My brother was also in a few bands, his name is Russ Stanton and he is friends with Jeff Labanski. Do you know him? Those are all great gifts. That is a fun little cat in the litter box. Ha ha ha ha ha! That poseable skeleton though! Um, I bet you never have to clean the litterbox! Pawsome gifts. TW wonders if the clip-on light is for the phone since she just got a light for the ipawd to make photos less grainy at night. oh my cats! we love the cat skelly and the litter box! seeing it posed in the litter box is hilarious 😀 you all received some very nice and thoughtful presents, Summer. great treat haul! What great gifts! Our mom would have done exactly the same thing with the cat skeleton too. Those are lovely presents for you and your human. the skeleton is cute, and yes, I would have posed it in the litter box too. 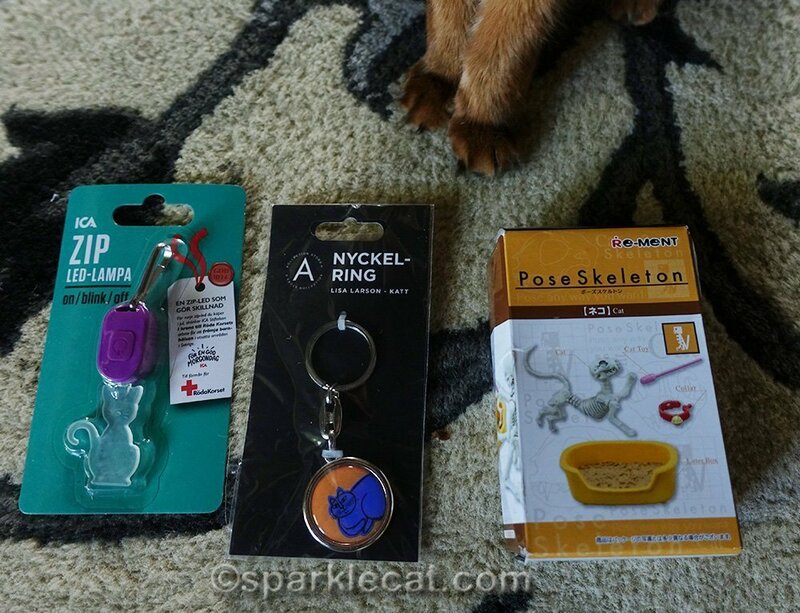 What pawsome gifts from your Swedish friends! Nice assortment of treats! Our Mom would have done the same thing! How awesome! Enjoy it guys. Mol! Those are great! Who knew you could get a tiny kitty skeleton and litter box?!? Ok those were great………until………….the kitty skeleton………….whatever flips your switch! MOL! Terrific gifts! 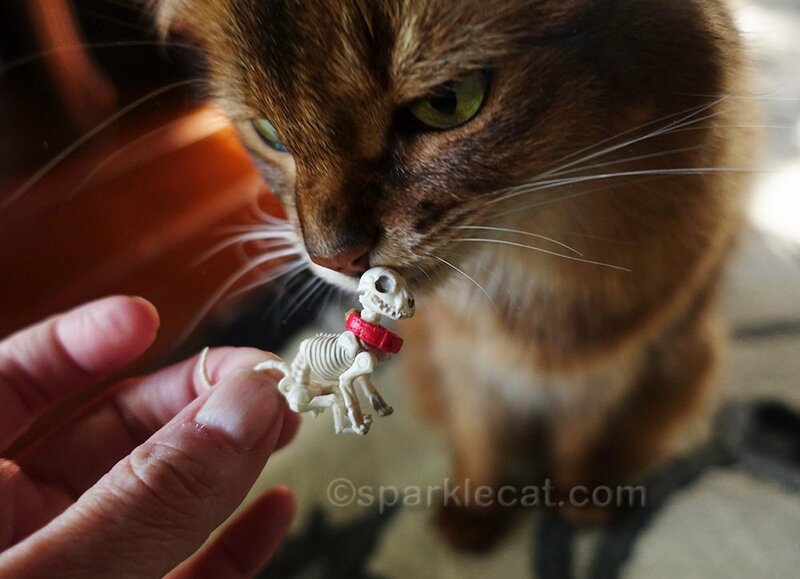 Glad it’s a mini-cat skeleton; a life-sized one is too creepy! 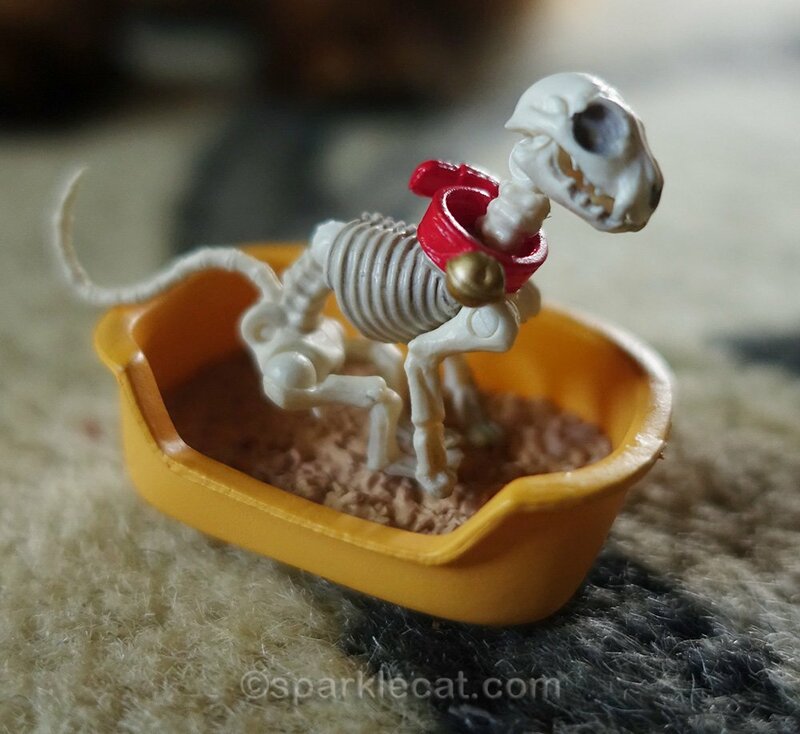 I remembered when I posted about the skele-kitty on one of my Miniature Monday posts. I had bought a few extra because I knew my sister needed one, and I have friends who also love skeletons, sooo….I knew you needed one! The little light thingy is a zipper clip, to make you more visible when walking at night. I also use them inside my bags, so I can see when I’m looking for something. We went past the display a few days ago…all the kitties were sold out, but they still have all the others (a dinosaur and a VW Beetle). And, oh, I know you love the Swedish kitty food and treats! 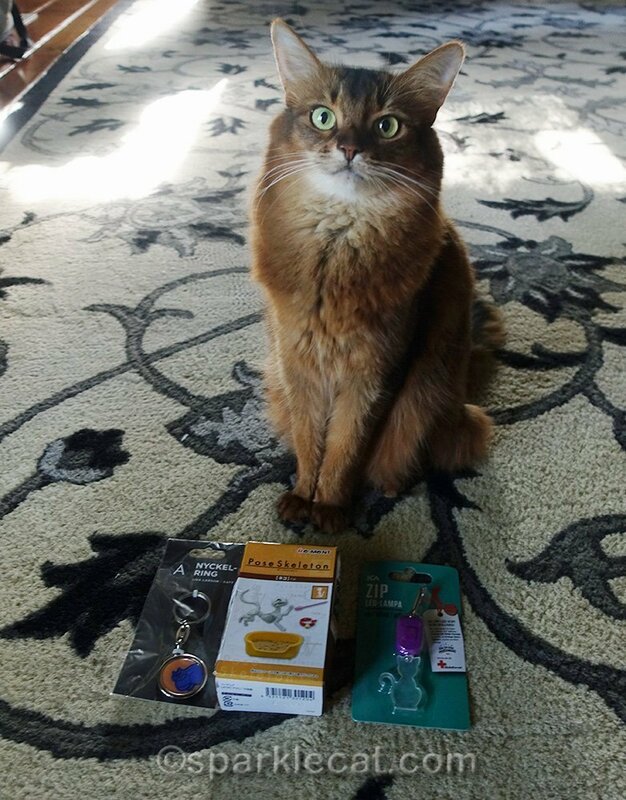 Wonderful gifts, still laughing over your comment on your human’s sense of humor! MOL! How nice of your friends to send all those gifts. That cat skeleton is unique and fun. I LOVE surprises and occasionally I get one too. I hope all 4 of you enjoy. What a nice surprise! Especially love the skeleton cat and his litter box! That was so sweet and the litter box gave me the giggles! Those are great gifts! Actually, we have never tried the Vitakraft sticks as #1 usually brings us back some from England. We have told her to get us some next time she goes shopping. That little kitty light is great, and the skeleton is awesome! girls who posed next to cars in the 50′, 60’s and 70’s. you have received with treats for everyone. What a nice gift for the middle of January! Anyone can give and receive gifts at Christmas time or on birthdays, but every day is worth celebrating, so I hope you all had a party with the fancy treats! I’m with your human; that little skeleton is pretty cute, especially in the litter box. Don’t bite it! !